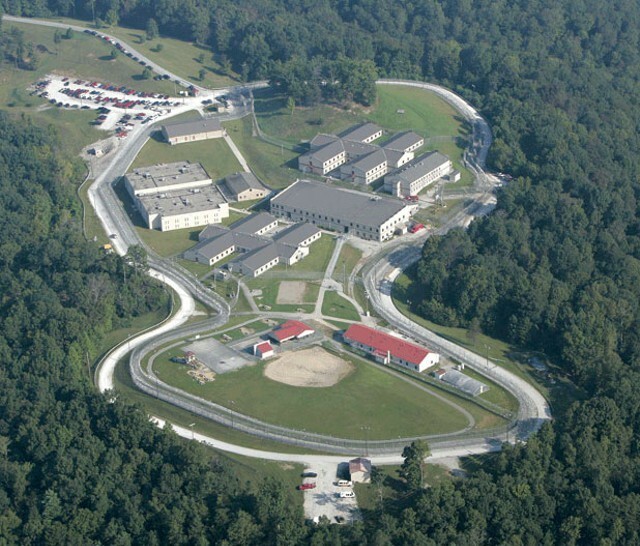 Lee Adjustment Center in Beattyville, Ky., holds 340 Vermont inmates. A proposal to close a state prison in Windsor would severely hamper the Department of Corrections' plan to end a controversial program that ships hundreds of inmates to out-of-state facilities, DOC commissioner Andy Pallito said. Trying to close a $113 million budget gap, Rep. Mitzi Johnson (D-Grand Isle), chair of the House Appropriations Committee, has proposed closing Southeast State Correctional Facility, which houses 100 inmates. That would save an estimated $820,000 in both of the next two fiscal years, officials say. Roughly 100 more inmates would be sent to private prisons, Pallito said. The controversial practice of sending inmates out of Vermont has gone on since the mid-1990s. Critics say it severs ties between inmates and their families and provides for a lower standard of inmate care. DOC is nearing the end of a two-year, $34 million contract with Corrections Corporation of America to house up to 660 overflow inmates. The agency is expected to announce a new contract with an out-of-state provider in April, and the DOC is currently finalizing the contract, Pallito said. CCA was one of two finalists. Almost all Vermont inmates in CCA's custody are housed in the Lee Adjustment Center in Kentucky. Some are imprisoned in Arizona. CCA currently has 340 Vermont inmates, the lowest figure in several years, Pallito said. He credits the decline to expanded treatment programs and initiatives to fight recidivism. DOC has room for 1,600 inmates in Vermont. "This would move us in the wrong direction, but we're still making progress," Pallito said of the proposal. "It changes the speed at which we can get there." Windsor is a relatively low-security prison and is also the DOC's smallest facility. If it closes, its inmates would be sent to other Vermont prisons, and inmates at those facilities would be sent out of Vermont, Pallito said. The transfers would likely occur in stages this fall. "It's a complicated proposal that requires a lot of thought," Pallito said. "This thing requires a lot of planning." The 50 employees working there would be reassigned, Pallito said. The DOC, which has roughly 1,060 positions, currently has about 80 vacancies, Pallito said. "Ideally, we will keep people employed," Pallito said, adding that it might not be possible to find jobs for everyone within an easy commute of the Windsor area. The $820,000 savings estimate factors in the additional cost of sending 100 more inmates to a private prison, Pallito said. In the past decade, there has been intermittent talk of closing the Windsor prison. But with the legislature facing a large budget deficit, the proposal has gained more traction this year. The proposal comes as a major criminal justice reform bill designed to dramatically lower Vermont's inmate population continues to flounder in the Statehouse. Suzi Wizowaty, executive director of Vermonters for Criminal Justice reform, the group that crafted the bill, called the proposal to close the Windsor prison "shortsighted and wrongheaded." Wizowaty said passage of the reform bill, which would reduce Vermont's prison population by several hundred inmates, would do more to save money. Closing the Windor prison would be good news for private prison providers such as CCA, which is bullish on future demand for its services. In documents filed with the U.S. Securities and Exchange Commission, CCA said it expects governments, even if they reduce inmate populations, to increasingly rely on private prisons in the future. The reason? Governments don't have the money or political will to build and maintain enough prison beds, the company said. "We believe the long-term growth opportunities of our business remain very attractive as insufficient bed development by our government partners should result in future demand for additional bed capacity," the company reported. CCA, which owns or controls 52 prisons and has 84,500 beds, said that as of December 2013, nearly 20 percent of federal inmates and 7 percent of state inmates were held in private prisons.